This event has NOT been confirmed by Bedlam management yet. But I see it and say.. Why Not. ? Shall I book the tickets ? Is this Hayley's first visit to Northern Ireland? If it is then I am very surprised that Bedlam have not ventured there before based on her success south of the border. Provided this event goes ahead, it will be Hayley's first solo concert in Northern Ireland but not her first visit. She supported Il Divo in Belfast on 27th March 2006. This event has been confirmed by Bedlam Management. many thanks for your message regarding the confirmation by Bedlam. Where are all the other Irish Fans ? and why aren't ye comin' te Derry ? comet, heres another one of Hayley's Irish fans! i've booked tickets for the belfast concert, as i wont be able to get to derry. this will be my first Hayley concert. i heard that sometimes she meets the fans afterwards - what are the chances of this happening in belfast? so you made it across to HWI. Here's an article from the Derry Journal. They confirm that Hayley will be performing for the Queen at Buckingham Palace next month. Kiwi songstress, and Classical Brit Award nominee, Hayley Westenra will perform for one night only on Saturday, 26th April at the Millennium Forum. Since her last visit to the Forum where she performed for the Dali Lama, Hayley has been awarded a Global Kiwis Young Achiever Award in her native New Zealand. This award recognizes the achievements of young people under the age of thirty-five who have achieved substantial success in their field on a national or global scale. Hayley began 2008 with a homecoming tour of New Zealand that sold out in record time. She will perform for the Queen at Buckingham Palace next month. Meanwhile, her album, Treasure, was recently nominated for a Classical Brit Award 2008. The four years since the release of Hayley Westenra's debut international album, Pure, have been a whirlwind. Along with her second album, Odyssey, and her third, Treasure, she has achieved combined sales ofwell over three million albums around the world, making her a household name in many countries and breaking many records along the way. Pure is still one of the fastest-selling classical albums in the history of the UK charts and Hayley is also the best-selling classical artist in Japan. Her latest album, Treasure, has recently become her third album in a row to hit both the top 10 of the UK album charts, and top of the classical charts in the UK - an astonishing achievement for a classical artist who is still only just 20! 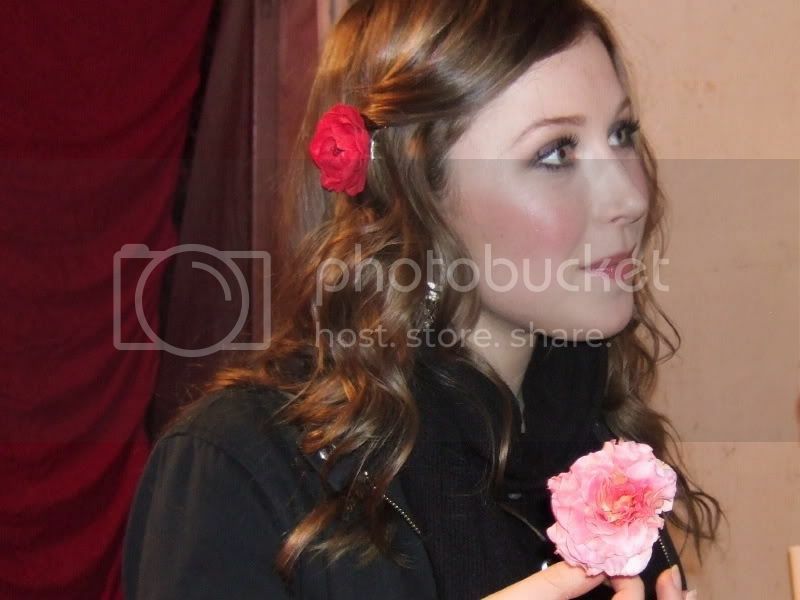 Poised, angelic and breathtakingly beautiful, HAYLEY WESTENRA’s voice has won the hearts of millions. Join Hayley at the Millennium Forum for this special performance as she performs a selection of her favourite classics. HAYLEY WESTENRA performs at the Millennium Forum on Saturday, 26th April. Tickets are now available from the Box Office. Telephone 71 264455. After the publication there should be an increased demand for the remaining tickets. Fortunately I've got one already. WOW ! only a week to go ! Yes as Northern said have a good time and Say hi to Hayley!